Step 1: For an 18-inch doll, cut fabric to measure 10-inches long 57-inches wide. (If your fabric is only 54-inches wide, simply remove one of the pleats in Step 4. For a 16-inch doll, cut fabric to measure 9-inches long by 45-inches wide. Step 2: 1/2-inch is allowed for a double-fold hem on each edge. 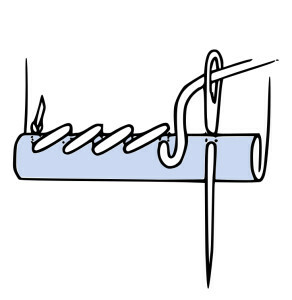 Turn under a double-fold hem along the top and bottom edges. Press to crease. Pin in place if necessary. Whipstitch to secure. Repeat this procedure for the side edges. Step 3: If desired, apply trim to the bottom and right edges. Pin trim in place, tucking the raw ends under. 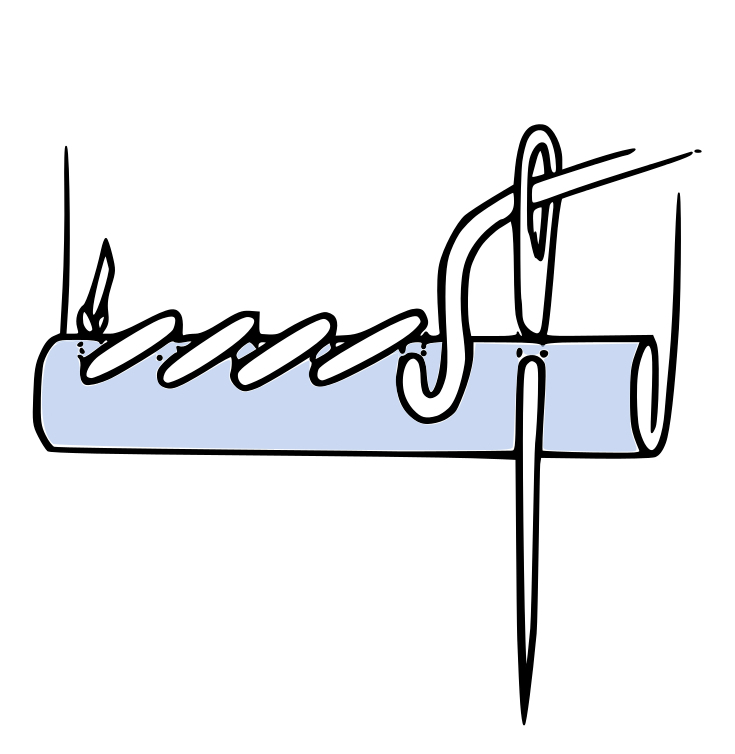 Use a running stitch to secure. Step 4: Mark the top edge of the Saree 15, 18, 21, 24, 27, and 30-inches from left edge for an 18-inch doll or 12, 15, 18, 24, and 27-inches from the left edge for a 16-inch doll. Working from left to right, make pleats, one on top of the other, at each marking. Pleats may need to be adjusted to accommodate dolls with differnt size waistlines. Pin the pleats together at the top to secure and arrange them so that they hang straight down. Step 5: With the right side facing out, line the proper right corner of the saree at the proper right side of the waistline. Making a complete turn from the proper right to the proper left, wrap the Saree around the waistline. 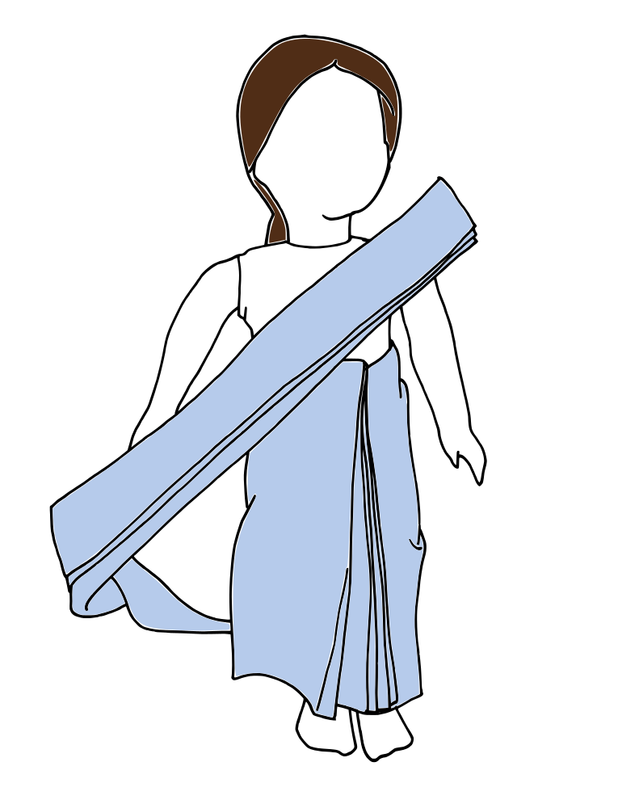 The lower end of the Saree should be slightly above the floor and the pleated section should crest at the center front of the waistline. Step 6: Tuck the fabric in around the waist to secure. If necessary, use a safety pin inside the waistline to keep it from coming apart. Step 7: Wrap the free end of the Saree, called the pallu, around the back and under the proper right arm. Neatly pleat the pallu. 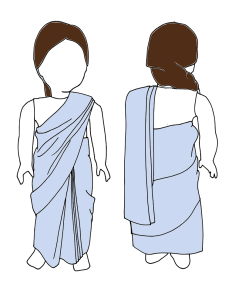 Step 8: Place the pallu over the proper left shoulder and adjust the front so that it covers the chest and drapes neatly. ©2015, Shari Fuller. All Rights Reserved. Always wondered how it was wrapped. What you you put under it?